All public relations emerges from particular environments, but the specific conditions of Israel offer an exceptional study of the accelerators and inhibitors of professional development in the history of a nation. 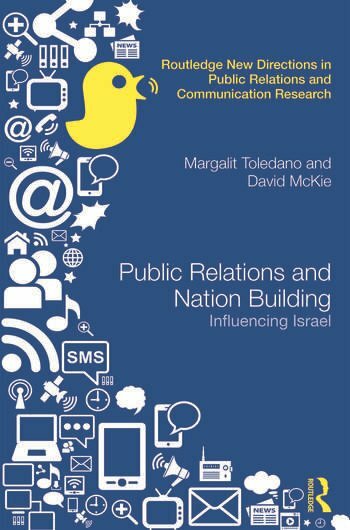 Documenting and analyzing the contribution of one profession to building one specific nation, this book tells the previously-untold story of Israeli public relations practitioners. It illustrates their often-unseen, often-unacknowledged and often-strategic shaping of the events, narratives and symbols of Israel over time and their promotion of Israel to the world. It links the profession’s genesis – including the role of the Diaspora and early Zionist activists – to today’s private and public sector professionals by identifying their roots in Israel’s cultural, economic, media, political, and social systems. It reveals how professional communicators and leaders nurtured and valued collectivism, high consensus, solidarity, and unity over democracy and free speech. It investigates such key underpinning concepts as Hasbara and criticizes non-democratic and sometimes unethical propaganda practices. It highlights unprecedented fundraising and lobbying campaigns that forged Israeli identity internally and internationally. In situating Israeli ideas on democracy in the context of contemporary public relations theory, Public Relations and Nation Building seeks to point ways forward for that theory, for Israel and for the public relations of many other nations. Margalit Toledano is Senior Lecturer in the Department of Management Communication at the University of Waikato, New Zealand. She holds an accreditation in public relations (APR), is a Fellow of the PRSA and PRiNZ, and is former President of the Israeli Public Relations Association. Margalit is currently on the editorial board of Public Relations Review and Public Relations Inquiry. David McKie is Professor in the Department of Management Communication at the University of Waikato, New Zealand. He has published or co-published four books (including the 2007 NCA prize winner Reconfiguring Public Relations), 22 book chapters, and 55 refereed journal articles. As CEO of RAM International Consulting, David works in leadership and strategic communication in Asia, Europe, and the United States.